Have you read a novel which you enjoyed not just as a reader but also as a writer, because you learned from it? 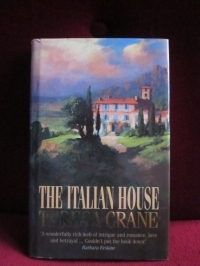 For me, one such book is The Italian House by Teresa Crane, which was published in 1995. It is the story of a downtrodden young wife, who, shortly after the First World War, unexpectedly inherits her grandmother's villa in Italy. A quirk of Italian law requires her to take possession in person, so she travels alone to Tuscany, where she falls in love with the place and with another man. But the Villa Castellini is a place of secrets and strange events in the present form a link to family secrets from the past. So what did I learn from reading The Italian House? Firstly, that the setting of a book can be more or less a character in its own right. The sense of place in Terera Crane's novel is so strong that the book ought to have a warning blazoned across the cover: This book will make you want to sell everything you possess and move to Tuscany. Secondly, that the quality of the writing is everything. The Italian House is just 284 pages long, whereas most novels I read are over 400 pages. Yet when I had finished it, the richness of the writing made me feel as though I had read something much longer – which isn't to suggest it is over-written or flowery. It isn't. In fact, it is written with economy. When the words are the right words, you don't need masses of them. Have you ever read a book that you learned from as a writer? I'm so glad you like the sound of The Italian House, Jan. It really is a wonderful book. You're right - reading becomes a different experience once you are a writer. I hope the books you mention have inspired you in your writing. I'm looking forward to reading your dual narrative book. Another great post, Sue. You've really sold 'The Italian House' to me. I find I read differently now I'm trying to write myself. My WiP is a dual narrative, as you know, and I find myself drawn to books with a similar structure. My tutor recommended 'The Hand That First Held Mine' by Maggie O'Farrell which I loved. More recently, I read 'The Secrets We Left Behind' by Susan Elliot Wright which is set in 1976 and the present day. I love the way the reader feels all the highs and lows of emotion felt by the characters. I think you've just added another book to my To Be Read pile, Jen. It isn't easy to capture a sense of place - I do admire writers who can do it. Thanks for dropping by. I'm reading one such book (for the second time) at the moment, 'Falling Home' by Karen White. It's one of those special books which stays with me both as a reader and a writer. The sense of place (a small Georgia town) and richness of White's characterisations move me. Thanks for your comment, Linda. The ability of Richard Hughes to enter fully into the child's perception of events was extraordinary. An early psychological novel, perhaps? A High Wind in Jamaica did it for me - the way Richard Hughes gets right inside his character's heads, even though most of them are children, and shows us their world from their perspective. And the ending is absolutely chilling - it gives me goosebumps even thinking about it. I remember Skellig being published. I was a children's librarian at the time and I remember what an impressive novel it was. What a tribute to Skellig that it inspired you to choose the young adult genre for your own writing. Thanks for sharing your experience, Christina. It's a whole year now since Minty was published - congratulations! Great post, Susanna. In answer to your question, I've learned many things from the books I've read. However, David Almond's Skellig was the one that prompted me to write young adult/crossover fiction. I'll always be grateful to him for creating that astonishing book and setting me on the path to publication.